Great for kitchen, laundry room, or garage. The Real Solutions by Knape & Vogt White Paper Towel Holder features durable polystyrene construction. The holder is easy to mount. The bottom of an upper cabinet or wall using 2 screws (not included). The Mason Mounting Post's rounded design is extroverted without being showy, substantial without being overbearing, bold without being brash. The posts combined with either a roller or towel bar (sold separately) create the perfect bath accessory. The Proslat Shlef and Paper Towel Holder is a practical accessory which holds products on top such as cans and oils and one paper towel roll or a 16 in. rubban rolls below. 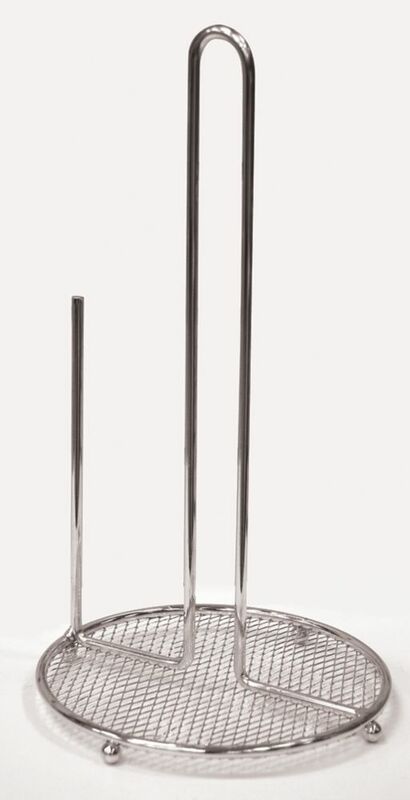 This stainless steel paper towel holder has a simple design to fit in any kitchen decor. It can be mounted to multiple surfaces. The installation is simple and easy. Paper Towel Holder Counseltron series of professional kitchen gadgets and housewares. For professional chefs. The ultimate collection of main kitchen tools such as ladles, spoons, turners and skimmers; essential gadgets like peelers, can openers, corkscrews and graters to sophisticated utensils like tea spoons and serving sets. A complete assortment for every need at the table and in the kitchen.